This SIM highlights the risk of exposure to Legionella from a previously unidentified source, namely aqueous tunnel washers. It details the type of equipment involved in the first known outbreak and outlines key issues that are likely to be applicable in similar plant. To raise awareness of potential risks from aqueous tunnel washers and similar plant where recycled water may be above ambient temperature and is sprayed. 1 In 2008 two employees at a large engineering firm were diagnosed with Legionnaires' Disease; the only common factor was their employment at the company. 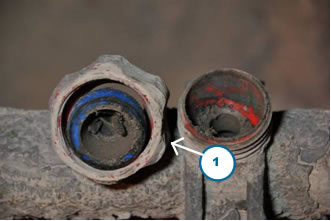 After investigation and sampling, the source of their infection was found to be an aqueous tunnel washer (pre-treatment plant) of the type that is typically found at motor vehicle and ‘white goods' manufacturing facilities. provides guidance on Legionella risks and control strategies for such plant. 3 The information will also be of interest to users, water treatment providers and manufacturers of this type of installation. 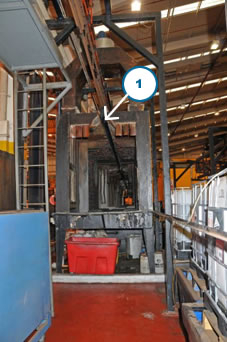 4 The plant was of the type used to pre-treat components prior to painting (e.g. with wet paint or powder coating). These components need to be clean and grease free and, particularly in the case of powder coating, ‘keyed' to accept the paint. 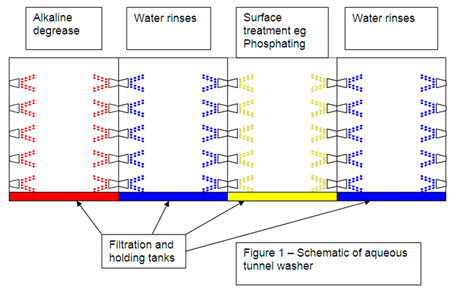 5 The pre-treatment plant comprised of a tunnel with a series of wash stations along its length as shown in the figure 1 below. another one or two unheated water rinses. After passing through the plant, treated components were then dried off in an oven before applying paint. 1) Overhead monorail track for transporting components through the tunnel. 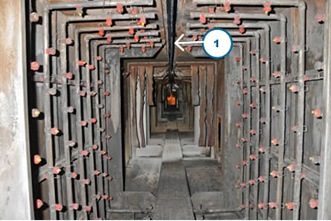 8 The solution in each particular compartment collected in the bottom of the tunnel and passed through a coarse filter (see figure 5) back into the external holding tank. Each wash station had a corresponding tank holding around 15000L. 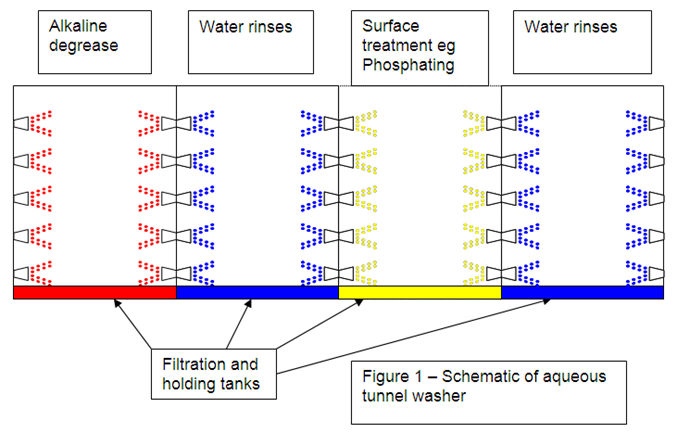 The rectangular holding tanks were constructed of mild steel with the potential for rusting and limescale deposits had also built up (see figure 6). 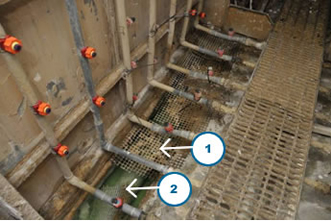 Oil and metal particles washed off from the components, passed through the plant, providing nutrients for microorganisms, and although the holding tanks were lidded, frequent access was required allowing further contaminants to enter the system (see figure 7). 10 Crucially, although the tunnel was compartmentalised and there were separate holding tanks for the different solutions, carry over (‘drag out') leading to cross-contamination was unavoidable. Consequently, whilst the rinse water was nominally ‘cold', there was significant heat gain from carry over of the heated solutions as well as heat transfer from the metal components. 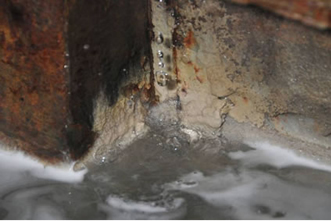 This resulted in the temperature of the wash water in the holding tank building up to between 25°C and 40°C (which is in the optimal range for Legionella growth). 12 The findings of this investigation led to water sampling and inspection of a small number of similar installations at other sites. Legionella was isolated from four out of five washers and in each of those plants, one or two tanks grew the bacteria. This suggests that similar tunnel washers have conditions conducive to growth of Legionella and may also pose a risk of Legionella exposure to workers. 13 The investigation has not looked at smaller, enclosed aqueous wash systems. a. Arranging for assessment of risks from Legionella in all water systems on site, with the assistance of a specialist company unless internal expertise exists. b. Ensuring that risks from process plant, as well as domestic water systems are included. c.	Considering risks to people other than those in the immediate vicinity especially if the plant is fitted with a ventilation system which extracts to atmosphere. d.	Examining in detail the design and operation of the plant and potential for proliferation of Legionella. f.	Considering whether processes can be kept either below 20°C or above 60°C to discourage bacterial growth. g.	Considering water treatment to reduce limescale and corrosion and filtration to remove suspended solids. h.	Considering flow rates through tanks and pipework to eliminate, stagnation and material deposition and identify deadlegs. i. Considering microbiological sampling to establish and monitor levels of contamination. j. Implementing a regime for draining down and cleaning the system. k.	Implementing a disinfection regime, if appropriate. l.	Reducing carry-over by designing jigs such that the orientation of suspended components allows the wash water to run off rather than collect in crevices and so the lowest point of the component leaves the tunnel last. m.	Consider the angling of spray jets at the entrance and exit of spray sections and designing equipment to minimize the amount of spray bouncing off components as they enter and exit. Flexible strip or air curtains or LEV at the entry and exit to the tunnel may help reduce the escape of aerosols. n.	Appointing a responsible person with the appropriate authority and competence, to oversee the risk controls. Design of plant e.g. are there loops, crevices, corners and deadlegs? Is there significant internal rusting? Is there rapid water contamination from the components? What is the water throughput and how rapidly is it topped up? How easy is it to access the tanks for cleaning? How effectively can the inside of the tunnel be cleaned? Will discharge of the water in the system exceed environmental consent limits, making regular draining down impractical? 17 The system will need to be drained to make effective cleaning practicable. Surface cleaning by swilling down with a hosepipe may not be sufficient to dislodge sludge and biofilm. Scraping away residual sludge and scale is likely to be required. 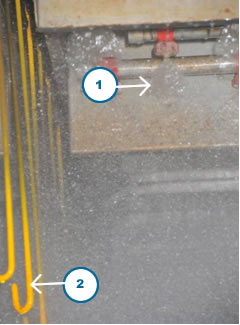 If jet washing is deemed to be necessary, precautions are required to minimise exposure to the mist which could contain bacteria and protect anyone who may be exposed, including cleaning and maintenance staff. 18 Those carrying out cleaning will need suitable respiratory protective equipment. This could be a powered filter and hood class TH3, or power-assisted filter and close-fitting full-face mask class TM3; however the filter on these systems can get wet causing operator discomfort. Alternatively an air-fed hood or full-face mask supplied with breathing quality air can be used. 19 A periodic chemical clean and scour will usually be needed to remove as much debris, scale and film as possible. The timing of this will depend on monitoring and inspection results, but will usually be required at least annually or during holiday shutdown periods. However, even this thorough clean may not remove all biofilms, because of the configuration of the equipment and bacterial population can quickly increase when the plant is re-started. 20 Arrangements should be in place to deal with holiday and extended shutdown periods, which may include draining down the tanks. 21 The risk factors with existing, and indeed new plant of this type, cannot be eliminated and draining and cleaning will at best only temporarily remove the biofilm and reduce bacterial load. Consequently, users will have to rely on the use of biocides to maintain control in the water systems. 23 The assistance of a specialist service provider should be enlisted to help make the choice of the most appropriate biocides, the dosing regime and monitoring strategy, and additional treatments for the control of scale, corrosion and sediment where required. The Legionella Control Association, founded by the Water Management Society (WMSoc) and British Association for Chemical Specialities (BACS) with the support of the HSE, administers a national code of conduct for organisations providing services for the control of legionellosis in industrial or commercial premises. All companies registering under the Code of Conduct must abide by the conditions of compliance. Registered companies are expected to offer a copy of a valid certificate to all clients along with a copy of the Code of Conduct. These organisations can be contacted to source assistance. 24 Advice of the plant manufacturer and paint supplier should also be sought to resolve issues of effects of the biocide on equipment and product quality. 25 Oxidising biocides such as chlorine or bromine-based biocides have been found to be particularly effective and the concentration, which is critical, is easier to monitor than non-oxidising products. However, possible long-term effects on degradation of components and corrosion of the plant need to be considered. 26 It may be necessary to alternate biocides to ensure that resistance does not build up and shock dosing with a strong oxidising biocide (e.g. chlorine dioxide) may also be necessary to bring the system under control if monitoring indicates unacceptable bacterial counts. 27 Microbiological monitoring should be carried out to establish whether control measures are working effectively. Dipslide tests should be carried out to measure general bacteria level in the water and this will act as an indicator as to whether the system is under control. Initially, monitoring should be carried out at frequent intervals to establish a baseline. The frequency of monitoring can be reviewed once this baseline has been established. 28 Dipslide results, by themselves, should not be taken as an indication of the degree of risk from the system, but the trend of counts can be informative (NB isolated sample results will be of little use). A simple guide is given below on how to interpret these. The figures relate to general bacteria levels. Changes in trends may be of particular significance, but it should be noted that these could also represent problems with the sampling regime. 29 Further advice on how to carry out dipslide testing should be available from the water treatment company. 30 In addition, sampling for Legionella should be carried out at regular intervals (at least every six months). 31 At the start of the assessment and monitoring process, different combinations of cleaning and treatment regimes may need to be tried until balance is achieved. 32 Plant operatives and maintenance personnel should be informed of the risks from this type of equipment and the potential for the 'bacterial balance' to quickly go out of control. 33 Adequate training on the application of biocides, including an awareness of risks from the biocide chemical itself should be provided; also training on how to perform the dipslide and other specified testing. This needs to be carried out in a controlled and consistent way to give a reliable result. 34 Workers need to be clear what to do if the system goes outside defined treatment control parameters and training on the use of PPE may also be needed. 35 The responsible person should ensure that there are procedures in place to deliver worker training and maintain operational expertise. 36 The user should obtain plant schematics and manufacturer's guidance on operational parameters to inform the risk assessor. 37 The risk assessment should be documented and available and operational procedures, including the cleaning, dosing and monitoring regimes should be clearly recorded. 38 The results of the dipslide testing should also be recorded. The use of a graph or table will assist in showing trends and will enable the user to decide whether the control measures are adequate and how often monitoring needs to be carried out to be certain that the cleaning and dosing regime are suitable. 39 A free half-day seminar was arranged in March 2009 to highlight the issues raised by this investigation. Attendees heard presentations from the investigation team; process operators; and water treatment and Legionella specialists. 40 Visiting staff likely to encounter this type of aqueous tunnel washer should familiarize themselves with the instruction in Legionellosis - dealing with the risk of exposure. In particular, you should only make a close physical examination of potential sources of legionella if you have received formal training on the FOD Control of Legionella: inspection of water systems course. 41 Legionella risk from cooling towers is identified as an indicative issue of evident concern or potentially major concern in OC 18/12. Inspectors are, therefore, requested to raise the control of aqueous tunnel washers if they are encountered during visits and advise on appropriate precautions. 42 As the legionella risk had not been previously associated with this type of equipment, initial enforcement expectation is likely to be advice/letter. However where all the risk factors listed above are present and no control measures are in place, there is a possible risk of serious ill-health and enforcement action should be considered. Inspectors can contact the Specialist Group (SG) Occupational Hygiene section, or HID Specialised Industries Division 4 for advice. 43 Inspectors should be aware of who (in terms of diversity e.g. men, women, disabled etc) is the target group in the sector they are dealing with. Give consideration to, and factor into the approach, any issues that may surround this audience such as literacy issues, English as a second language and disability. 44 Further information can be obtained from the Manufacturing Sector.